The RailEasy™ Cable is used for cable railing applications. It is made from grade 316 stainless steel and features a diameter of 5/32″ with a 1×19 strand construction. 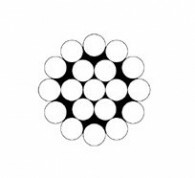 This cable is available in rolls of 25, 100 or 500 feet. Look for the red RailEasy™ label so you know you’re getting high quality cable.